Chelsea host Arsenal in the Carabao Cup semifinal 1st leg on Wednesday night, a week after they met in the Premier League. Who will win at Stamford Bridge? 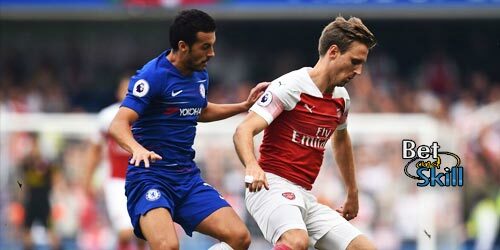 This article contains our Chelsea vs Arsenal betting preview with free predictions, betting tips, starting lineups, team news, enhanced odds, esclusive promotions and no deposit free bets! Eden Hazard should be ready to make his return to action for Chelsea, while there are no fresh injury concerns. Ross Barkley will have to wait to make his Chelsea debut as he continues to recover from a serious hamstring injury. Tiemoué Bakayoko was poor at the Emirates and Conte may think about changing him for Danny Drinkwater here. The likes of Cesar Azpilicueta, Gary Cahill and Andreas Christensen will form the three man backline as David Luiz played 90 minutes in the FA Cup to continue his recovery from injury and is unlikely to be risked for the midweek game. Arsenal enter this fixture off the back of one of their worst results in recent years - a 4-2 defeat at Nottingham Forest and were dumped out of the competition. That was their 3rd winless game in a row after, having previously drawn at home against Chelsea (2-2) and at West Brom (1-1). Arsene Wenger's men sit 6th in the Premier League standings, 5 points below the top 4 places. They have conceded 12 in the five fixtures since their last clean sheet. In the EFL Cup, the Gunners sealed a 1-0 victory over West Ham to set up this mouth-watering two-legged tie. The visitors are expected to be without Granit Xhaka, who has been struggling with a groin strain and joined Olivier Giroud and Aaron Ramsey in the treatment room. Saed Kolasinac, Nacho Monreal, Laurent Koscielny and Santi Cazorla are long-term absentees. Up front, Mesut Ozil and Alexis Sanchez are expected to start behind the lone striker Alexandre Lacazette while Francis Coquelin and Mohamed Elneny are in contention for a strating berth in midfield alongside Jack Wilshere. Hector Bellerin and Ainsley Maitland-Niles will play as wing backs in the 3-4-2-1 starting system. "Chelsea vs Arsenal predictions, betting tips, lineups and free bets (EFL Cup - 10.1.2018)"